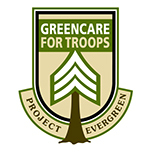 SiteOne Landscape Supply and leading industry suppliers are stepping up to recruit contractors as new volunteers for Project Evergreen’s GreenCare for Troops Initiative. GreenCare for Troops is entering its 12th year providing complimentary lawn and landscape services for the families of currently deployed military personnel and Post-9/11 disabled veterans with a service-connected disability. Through a pilot program—being offered in New York, Connecticut and Massachusetts—new volunteers who complete the program’s online registration and agree to help at least one military family with free lawn and landscape services will be rewarded with special discount coupons. The discounts will be redeemable at SiteOne locations in Connecticut, Massachusetts and New York for select turf maintenance and control product purchases. Nufarm is the presenting sponsor, and Toro is the platinum sponsor of the GreenCare for Troops program.